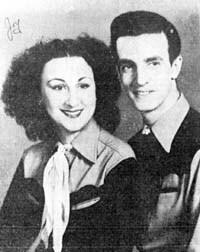 Joy and Slim were heard on many of the "taped shows" from Pine Crest Ranch. They performed both as solos and as a duet. An undated folio mentions that their version of the "Monkey Song" and "Alleuetta" were always favorites with the kids in the audiences. Hillbilly-Music.com wishes to thank Gordon Brown, of the New England Country Music Historical Society for the photo and notes for this artist.